Countertop 3-canister filter requires no plumber. 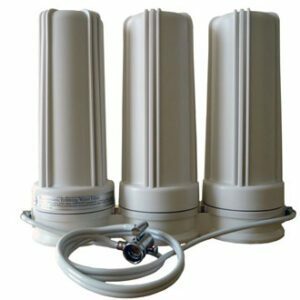 Water filter typically used for well water in rural areas where water is contaminated with agricultural nitrate runoff, and has fluoride you would like to filter. This unit has 3 cartridges. Each contains a sediment filter. One is an FLUORIDE filter. One is a NITRATES filter. The third contains both kdf for heavy metals and chemically-based contaminants, and granulated carbon for volatile organic compounds. Carbon is leaves good tasting water. These filters have the best and the most filter material so that your filter does more and lasts longer. The kdf has the FOAM ADVANTAGE. This increases the effectiveness of the kdf, and improves the efficiency, effectiveness and life of the carbon. REMOVES NITRATES & FLUORIDE & OTHER CATEGORIES OF CONTAMINANTS. In addition to the cartridges focusing on fluoride and nitrates, will filter heavy metals like lead, bacteria, ecoli, hormones, sediment, algae, molds, scale, chlorine, chlorination byproducts, bad taste, odors and hundreds of contaminants with a combination of the highest quality FOAM ADVANTAGE kdf and granulated coconut carbon filtering. Bacteria cannot grow in the carbon because of copper-zinc. Copper and zinc will both be in your water at trace levels – a portion of the minimum dailly requirement our bodies need. To see a list of contaminants filtered in addition to nitrates and arsenic, see What Is Filtered? Comes with fluoride (FR-1 or BC-1), nitrate (NR-1) and standard KR101N cartridges. 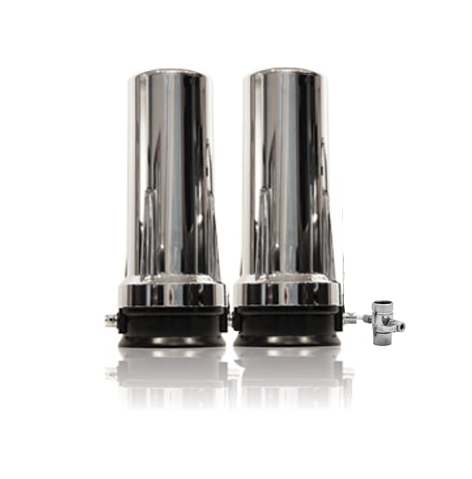 Your water condition may effect how often filters are changed, especially the nitrates filter cartridge. Once a year is a good estimate for well water without extreme issues. The Counter version The size is 4.5″ deep, 12″ high, and 15″ wide. You easily hook up the countertop version by screwing a diverter onto the end of your kitchen faucet. 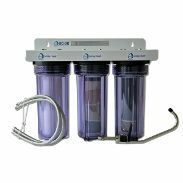 Email us your well water test results if you would like some help to determine the right filter for your water conditions.